Rob claims he's helping to save the planet by eating food that's going to waste. But Feifei's sure it's just a way for him to save money and get everyone else to buy him lunch! Listen to this programme to find out if he really has become a freegan or he's just a cheapskate! Yes I am. Hello.And I'm feeling a bit peckish. You know, a little bit hungry. Well when we've finished, you can go down to the canteen and buy yourself a bite to eat. A bite to eat – a snack, a sandwich and a packet of crisps maybe. And can you get me something too please? No I won't be doing that – not now that I'm a freegan. That means I don't pay for food - I only eat what's free. Right. So Rob, how do you get it – beg for it, steal it? Of course not, Feifei. I just eat food that's been wasted – maybe thrown away by supermarkets or restaurants. You know, I hate to see food being wasted. Me too. So a freegan eats food that has been wasted - maybe because it is out of date or too much has been made. Wow, Rob. This sounds like a good idea. Yes it is. Let's hear from some other freegans in these examples – which are also free! Thrown away food isn't rubbish, it's free food! That's why I'm a freegan. 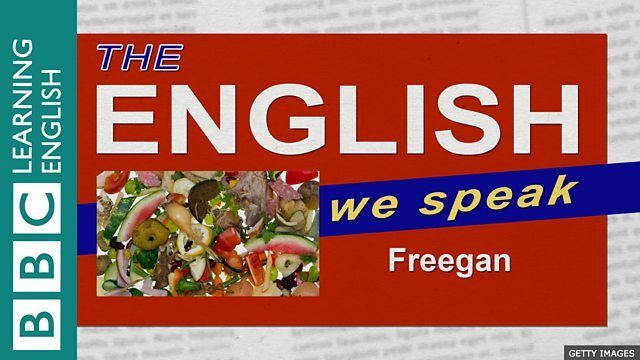 This is The English We Speak from BBC Learning English and today Rob is telling us about being a freegan – that's someone who only eats food that has been wasted or thrown away. And Feifei, freegans like me don't just eat free food, we give it to people who need it more than us. Rob, you've changed. Why are you being so responsible and charitable? I'm just a good person – oh and it's saved it me loads of money. Oh I get it. You're not being a good person – you're just being tight! Tight – you mean not generous? Honestly! You're not a freegan – you are a freeloader. Someone who expects things for free without giving anything in return.Come on admit it Rob. Ermm, I'm just going to the canteen. What was it you wanted? Oh and could you lend me some money to buy something please?